Ok, heres how this works. You create a card to the specifications of the person above you, then list your own card idea for the next person. I'll start. If X is 2 or lower, draw X cards. If X is 3, put X +1/+1 counters on X target creatures. If X is 4, return X target creatures from your graveyard to the battlefield. If X is 5 or more, Variety deals x damage to target creature or player. If X is 10 or more, you win the game. Create a life gaining multicolored Turtle with power twice it's toughness or vice versa. Create an Izzet Planeswalker that has no ability to gain loyalty counters. August 28, 2015 9:39 p.m.
August 28, 2015 9:58 p.m.
August 28, 2015 10:11 p.m. Edited. Create a double-faced version of a planeswalker that does not appear in Magic Origins. August 29, 2015 1:59 p.m.
August 29, 2015 2:09 p.m. Whenever Sarkhan attacks, it deals 1 damage to each creature the defending player controls for each attacking creature, then if the defending player controls no creatures, exile sarkhan, then return him to the battlefield transformed under his owner's control. +2 Draw two cards, then discard a card. -9 Put 5 4/4 Dragon creature tokens with flying and haste onto the battlefield. August 29, 2015 4:10 p.m.
August 29, 2015 4:10 p.m. Edited. You're catching on, its a ninja conspiracy. August 29, 2015 4:14 p.m.
August 29, 2015 4:21 p.m. Whenever another creature enters the battlefield, if its power and/or toughness is exactly 5, draw five cards and discard five cards. Create a flavorful legendary creature with the Berserk ability. August 29, 2015 5:25 p.m.
August 29, 2015 5:52 p.m.
B, Pay 2 life: Destroy target artifact or enchantment. August 29, 2015 5:59 p.m. Whenever Giant Wolf attacks, tap it. It doesn't untap during it's owners next untap step. 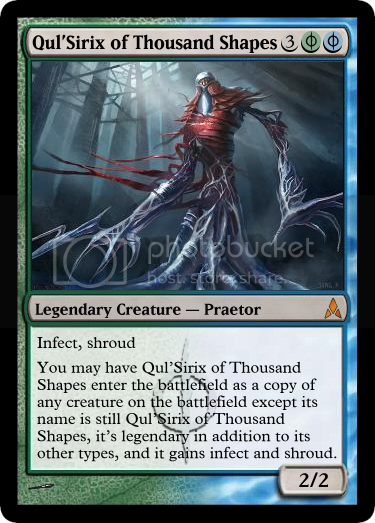 August 29, 2015 10:33 p.m.
Oh, and create a Legendary Creature with three colors that is tribal. August 29, 2015 11:04 p.m. Whenever the first beast creature you control enters the battlefield on your turn, it gains haste, trample and +X/+X, where X is its power. Just like thunder is in tandem with lightning, so is king in tandem with beast. Make a blue or hybrid blue planeswalker or flipwalker that is 1 CMC. September 1, 2015 10:53 a.m.
Why couldn't it be 2CMC... I already have an award winning design that meets those criteria :D. Ok, then, here's my 1CMC flipwalker. Not much if you ask for my personal opinion but whatever, nobody posted anything in two days so I might as well get this thing moving again. Next assignment: Make a land that produces colorless mana. How much mana that is or what else it does is up to you. September 4, 2015 2:46 a.m.
You may have any number of ~ in your deck. When ~ enters the battlefield, sacrifice it unless you pay . Tap: Add to your mana pool. Sol lands have been redefined. Next - Make a Rakdos hybrid creature with a thematic new mechanic for RtR 3. September 4, 2015 2:55 a.m. Whenever Rakdos Fleshburner attacks, it deals 1 damage to each of three creatures defending player controls. Try to jam as many Future Sight mechanics as possible onto a single card. September 4, 2015 8:37 a.m.
Echo - Discard your hand. When ~ ETBs, assemble a 0/1 colorless artifact creature called Contraption. Tap, sac a contraption: Look at target player's hand and exile a card. That card gains suspend 4. Grandeur - Assemble 5 contraptions. Next, make a tribal non-creature card for Rats. September 4, 2015 9:07 a.m. Put a 1/1 Black Rat token with Deathtouch onto the battlefield for each card named ~ in your graveyard. September 4, 2015 9:25 a.m. I like the rat card, may be a bit too powerful, but very cool. There are male angels. Gabriel Angelfire is an angel too. HE has a heart, but you have broken it. But I will meet you half way. When ~ attacks, if it's is renowned, you may put target creature from your graveyard with power less than ~'s power onto battlefield tapped and attacking. Next, what would happen if Garruk took the Chain veil from Liliana to boost his power? September 4, 2015 10:13 a.m. Edited. +2: Put a 3/1 Demon Beast black creature token onto the battlefield. -7: You get an emblem with "At the beginning of your upkeep put three 3/1 black demon beast tokens onto the battlefield." and "Demons and Beasts you control get +1/+1. September 4, 2015 10:29 a.m.
Oh, and create a planeswalker with X in the cost. September 4, 2015 10:31 a.m.
September 4, 2015 10:33 a.m. But... the color pie... must not violate... the pie...! Oh well... here it goes! Choose a creature type. Counter target spell with CMC X or less, where X is the number of creatures you control of the chosen type. If you have not lost any life this turn, put 2 1/1 changeling creature tokens on the battlefield. The nature of our pie has been violated irreversably. Make a mythic card that combines with other copies of it (similar to Faerie Miscreant) but make it a non-creature. September 4, 2015 10:45 a.m.
At the beginning of your upkeep, choose one: Target player loses three life, you gain five life, Five Sun's Powerstone deals 5 damage to target creature, draw 2 cards, or put 2 +1/+1 counters on target creature. Repeat this process for each other artifact named Five Sun's Powerstone you control. Create an Aura that benefits everything but the enchanted creature. September 4, 2015 11 a.m.
Enchanted creature loses all abilities, each other permanent gains the abilities lose this way. Make me a planeswalker based of a Wall. September 4, 2015 11:18 a.m.
+2 - Gain life equal to the amount of defenders on the battlefield. -3 - Each creature you control with defender may attack as though it didn't have defender until end of turn. Creatures your opponents control with defender can't block this turn. -12 - You get an emblem with, "All creatures lose all abilities, have shroud, and gain defender. If it would lose defender, it doesn't instead." Make me a Legendary Creature that is great on its own, but an atrocious commander. Ooh, and if you can, make a custom ability too! September 4, 2015 12:04 p.m.
Permanents you control are Dragons in addition to their other types. If a Dragon you control would be the target of a spell an opponent controls, instead counter that spell and put a +1/+1 counter on each Dragon you control. 2R: Change the target of target spell or ability to Sproghk. 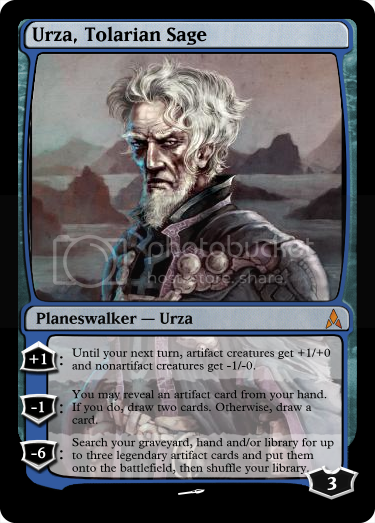 Create a card for Urza that is broken, but only when you have the urzatron. September 4, 2015 12:16 p.m.
tap add 1 mana to your mana pool. whenever a land with "Urza" in it's name enters the battlefield, add 5 mana to your mana pool. 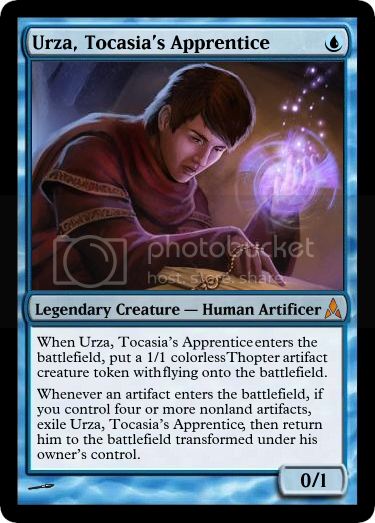 If you control seven or more lands with "Urza" in its name, you win the game. September 4, 2015 12:32 p.m. Whenever a player casts an instant or sorcery spell, put a 1/1 illusion creature token into play with "whenever this creature becomes the target of a spell or ability, sacrifice it"
September 4, 2015 1:51 p.m. Whenever Dakra attacks, you may put an aura from your hand onto the battlefield attached to Dakra. At the beginning of your end step, return all auras attached to Dakra to your hand. Make a red instant/sorcery with a black ability. September 4, 2015 2:14 p.m. Edited. Destroy target creature. If target is destroyed in this way exile it instead. September 4, 2015 2:36 p.m. Remove a black card and a green card from your graveyard: Regenerate Hideous Ghoul. Create a card that would absolutely wreck an Abzan Midrange deck. September 4, 2015 2:45 p.m. If an opponent would gain life, they instead lose that much life and Rotting-Tree Wall gets +1/+2 until end of turn. 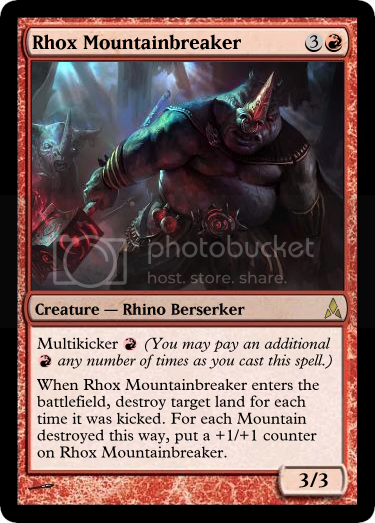 Create a flavorful card named Rhox Mountainbreaker. September 4, 2015 3:34 p.m.
Next: Create an anti-dragon equipment. September 4, 2015 3:59 p.m.
September 4, 2015 4:14 p.m. Smash as many abilities into one creature as possible! I don't care if it has to be legendary, five color, or high cmc, make it chocked full of abilities yet balanced! September 5, 2015 12:19 a.m. Create a card based on one of roborosewater's tweets. September 5, 2015 11:05 a.m.
1G look at target player's hand and choose a nonland card from it. You may play it with paying its mana cost unless target player puts the top five cards of their library into the graveyard. based off of sacred fist, Give me the best five color commander. September 5, 2015 4:07 p.m. Whenever a player casts a multicolored spell, if it's the first spell cast this turn, counter that spell. If you do, put X +1/+1 counters on Prismatic Pentarch, where X is that spell's converted mana cost. September 5, 2015 5:31 p.m.
My challenge is to create a unique, but balanced, nonbasic dual land! September 5, 2015 5:32 p.m.
Duel - when Dueler's Arena attack, add W or R to your mana pool. Create A group hug card that benefits you opponents at first, then turns the tides. September 5, 2015 8:10 p.m. When Demon's Gift enters the battlefield, if it isn't a token, each other player puts a token that's a copy of it on the battlefield under their control. At the beginning of each upkeep, put a charge counter on Demon's Gift, then gain life equal to the number of charge counters on it. If Demon's Gift has 10 or more charge counters on it, instead you lose 10 life. At the beginning of your end step, if Demon's Gift has 10 or more charge counters on it and it isn't a token, sacrifice it. Create the most flavorful goat creature possible. September 5, 2015 8:51 p.m.
Billy Goat attacks every turn. If you are deemed to loud by the player next to you, sacrifice him. 3 billy goats gruff? Too loud on the bridge? Wants his food? Get it? Well anyway, make a conspiracy which which interacts with the command zone. September 5, 2015 8:59 p.m.
You may pay rather than pay the mana cost for cards in the command zone, where is the card's converted mana cost. Make a card that gives your opponent a major advantage over you, for a very steep price. September 5, 2015 9:14 p.m.
: Draw a card for each card in your Command Zone. Activate this ability once per turn, during your main phase. Note that this card interacts with your commander in EDH as well as other conspiracies. Create a card that costs 15 or more mana. September 5, 2015 9:15 p.m. Instead of casting creature or planeswalker cards in the command zone, you may pay their mana cost and put them onto the battlefield tapped. How can you believe everything the commanders say? It's a conspiracy, sheep! Create a Timmy/Johnny Vorthos card that everyone loves except Spike. September 5, 2015 9:21 p.m.
Search your library for all white cards and put them into your hand, you may play them without paying their mana cost, those of which that are creatures gain haste. Search all your opponents zone and exile all black cards, then put all remaining cards in their respected hands. target opponent may sacrifice all nonland permanents they control. If they do, you also sacrifice all nonland permanents, then they may search there library for a nonland and put into play. September 5, 2015 9:30 p.m.